Today I’m sharing my top daily vitamins and supplements. Have you ever stood in the vitamins aisle at Whole Foods or the drugstore wondering which ones to buy and why? I’ve been there. The world of vitamins and supplements can be confusing and overwhelming. Which vitamins should I take? Which brands are the best? Should I just go for an all-in-one or take individual ones? Am I deficient in certain vitamins? Can’t I just get everything from food? Here’s the list. For the full details on these and why I take them, keep reading. These are the most important vitamins and supplements that I take daily and that I feel have made the most difference for me. I take others specific to my own needs, but my top daily vitamins are those I think would be beneficial to most others. Studies have shown that a majority of Americans are deficient in vitamins D, K, and magnesium which is part of the reason I take these as a supplement. These daily vitamins and supplements are particularly helpful for cognitive function, restful sleep, digestion and immune system as well as protection against heart disease, cancer and other conditions. I’ve researched these brands and picked the ones that offer the best balance of purity/effectiveness and value for money. Although these are more expensive than standard drugstore brands, they are much higher quality, and when it comes to vitamins and supplements you get what you pay for. Lower quality vitamins are often filled with questionable ingredients such as sweeteners, artificial colors and preservatives, in addition to variance on the stated amount of each vitamin. Why Take It: I have not found an all-in-one vitamin that gives me the higher doses of vitamin C, D, and magnesium, which really make a difference for me. However, when I do take a multivitamin, I like to take a whole food vitamin. Whole foods vitamins contain nutrients in a balanced form which closer to nature and are easier for your body to use. How to Get It Without a Supplement: Getting all of our nutrients from food is difficult because most of us don’t eat a diet that’s varied enough, some of us have allergies that prevent consuming foods that would provide the required nutrients and soil depletion means that foods are not as nutrient-dense as they were decades ago. Brand I Use: Garden of Life Vitamin Code Women’s Raw Whole Food Multivitamin. I’ll be trying the Garden of Life myKind certified organic version next time I buy multivitamins. A men’s version is also available in both the Vitamin Code and the myKind organic line. 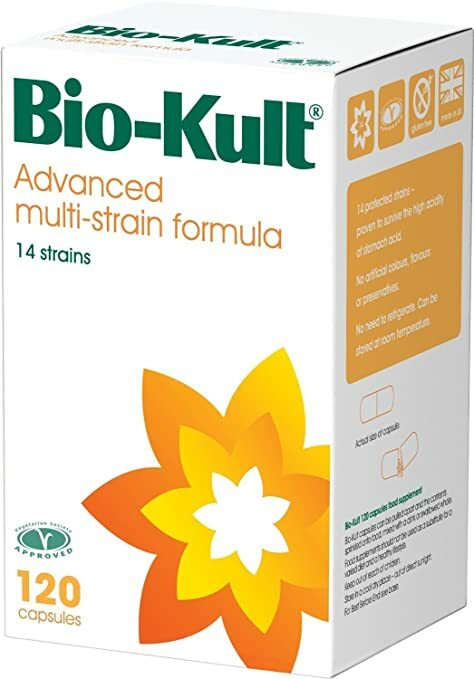 Watch Out For: It includes probiotics, but only 500 million CFU, which is not at a level that will make much of a difference, so I use a separate probiotic (see below). Because these are whole food vitamins, you should read the label carefully and ensure you aren’t allergic to any of the food items included before purchasing. Why Take It: Our bodies can’t make omega-3 fatty acids—eicosapentaenoic acid (EPA), docosahexaenoic acid (DHA), and alpha-linolenic acid (ALA)—so it’s important to get them through diet and supplements. Fish oil offers many benefits for a wide range of conditions such as fighting inflammation, improving conditions such as arthritis, migraines, Alzheimer’s, anxiety, depression, epilepsy, ADHD and more. How to Get It Without a Supplement: EPA and DHA are primarily found in fatty fish, such as salmon, tuna, and anchovies. ALA is found in plants and is available in vegetable oils, nuts, and flaxseeds. The problem with wild-caught fish is the risk of mercury which is higher when eating the big fish who eat the little fish (avoid swordfish, bluefin tuna, king mackerel and focus instead on wild Pacific/Alaskan salmon, halibut, anchovies, sardines, mackerel). Farm-raised fish presents its own challenges as they are often contaminated by industrial chemicals, pesticides, bacteria and parasites, antibiotics and artificial colors/additives. And then there’s fish fraud. Brand I Use: Nordic Naturals – Ultimate Omega gives over 1200mg of omega-3s (EPA + DHA) – which is about what you’d get from one serving of salmon. I’ve never had any problems with fishy aftertaste or burps unlike some other brands. I take their products myself and also give my daughter the Nordic Naturals Ultimate Omega Junior soft gels, and when she was a baby, I used their Baby DHA liquid and then the Children’s DHA liquid as she grew. Watch Out For: It’s extremely important to be sure that you are taking a pure fish oil because studies have detected trace amounts of polychlorinated biphenyls (PCBs) in some brands of fish oil supplements. PCBs are industrial chemicals linked to cancer and banned in the 70s, but still found in fish exposed to contaminated water from soil runoff. There are no U.S. governmental regulations on fish oil quality, but Nordic Naturals adheres to strict European standards. They also publish the results of third-party testing on their products. Nordic Naturals fish oils are also in the triglyceride form which is more bioavailable than ethyl ester form (which also oxidizes i.e. goes rancid more quickly). Check the bottle before purchasing any fish oil – if it’s in triglyceride form, the bottle will say so. If it doesn’t, then the fish oil is in the cheaper ethyl ester form. Why Take It: Probiotics are important for digestion and the immune system, but can also be used to treat bloating and gas, lactose intolerance, IBS, diarrhea, yeast infections, and more. It’s also important to take probiotics when you’re taking antibiotics, which can wipe out your natural healthy gut bacteria. There are studies that show babies whose mothers took probiotics during pregnancy were less likely to develop eczema (obviously check with your doctor before taking anything while pregnant). How to Get It Without a Supplement: You can get probiotics from fermented foods such as yogurt, kombucha, kefir, sauerkraut, and more, but especially in the USA, most of us do not eat enough fermented foods to provide the probiotics we need. Brand I Use: I like these two brands in particular because they don’t need to be refrigerated. I alternate between Garden of Life Probiotics Supplement for Women (Men’s version here) and Bio-Kult which I really like because my daughter and I can both take it (there’s also an Infant version here which I think might be new and I haven’t tried – we used OptiBac when my daughter was a baby). Why Take It: This has probably made the most difference to how I feel on a daily basis. Vitamin D is widely known as being important for bone health, but studies have shown it has a much wider impact on overall health. It benefits the immune system, and vitamin D deficiency has been linked to a wide range of conditions including diabetes, cancer, cardiovascular disease, Alzheimer’s, and depression. I first started taking it years ago when I lived in London and my doctor there tested my levels to find that I was extremely deficient. I ended up taking a prescription level dosage for a few weeks before switching to an over-the-counter version. Now I have my vitamin D level tested regularly by my doctor, and I adjust how much I take based upon that – it makes sense that you will need more during the winter when you spend less time outdoors in the sunshine. The Endocrine Society Practice Guidelines recommend a minimum vitamin D blood level of 30 nanograms/ml as an acceptable level, and my own doctor told me she likes to see a level around 80 nanograms/ml. How to Get It Without a Supplement: We get vitamin D from food, and it’s also a hormone that our bodies also make from the sun. However, more than half (some studies say up to 75%) of the population is deficient. Makes sense since most of us don’t spend enough time outdoors, and when we do, we’re advised by dermatologists to wear sunscreen, hats, and stay out of the sun. Foods high in vitamin D include cod liver oil, fatty fish such as salmon, shrimp, oysters, eggs (3-4x higher levels in pasture-raised eggs), and wild mushrooms. Brand I Use: I use the Metagenics brand of D3 which includes K2 – this is important for directing calcium to the right location – to your bones rather than your arteries. Watch Out For: It’s important to test your levels because vitamin D toxicity is a thing – your body won’t make too much from sunlight, but you can overdo it with high dose supplements. For example, taking 60,000 units per day for several months has been shown to cause toxicity. That’s an extreme amount to take on a prolonged basis – when my doctor diagnosed me with vitamin D deficiency, she prescribed 20,000 per day for a few weeks. 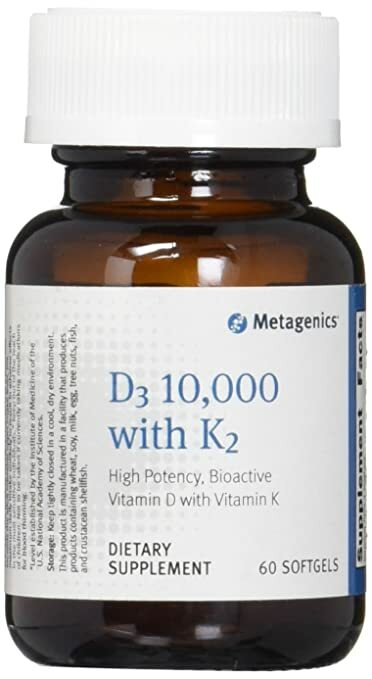 The Metagenics vitamin D3 with K2 that I take now is 10,000 iu and I take this between 2 and 7 times per week, depending on what my levels are (which I get tested twice per year). Why Take It: Our bodies can’t make vitamin C, so it’s crucial to get this through diet and supplementation. Vitamin C is a powerful antioxidant and helps with metabolism and immune system. It also helps protect against heart disease and some studies have shown effectiveness against cancer and Alzheimer’s. It also helps with collagen production, which is important for skin and hair as well as bones and joints. I take 3000mg daily as recommended by my doctor who is a proponent of high dose vitamin C and offers vitamin C through intravenous therapy. Vitamin C is water-soluble and your body will eliminate what it doesn’t need. How to Get It Without a Supplement: Vitamin C is found in fruits and vegetables, especially guava, bell peppers, citrus, strawberries, brocolli, kale, kiwi, pineapple, and brussels sprouts. You get more vitamin C from raw fruits and vegetables – if you must cook them, try to steam rather than boil. Brand I Use: I use a combination of two brands of vitamin C. Both are liposomal, which is better absorbed by your body. Lypo-Spheric Vitamin C by LivOn is fantastic but pricey, so I tend to use it when I’m feeling under the weather – then I take 2-3 packets per day and I really feel the difference. On a daily basis, I take Dr Mercola Liposomal Vitamin C liposomal capsules. Why Take It: This has helped me specifically with migraines and sleep, but magnesium has many more benefits. It helps fight inflammation, depression and anxiety, diabetes, and more. This particular form of magnesium (L-threonate) has been shown to target the brain and nervous system, providing more benefits for cognitive function (and less of a laxative effect than other forms of magnesium). How to Get It Without a Supplement: Foods rich in magnesium include avocados, leafy greens, nuts (especially brazil nuts, almonds, cashews), seeds (pumpkin, flaxseed, chia, sesame), dark chocolate, legumes, salmon, bananas and whole grains such as quinoa and buckwheat. Epsom salt baths, magnesium lotion or magnesium oil are other ways of getting magnesium topically. Brand I Use: Life Extension Neuro-Mag Magnesium L-Threonate. The price on Amazon varies, but it’s almost always cheaper to buy the 2 pack. What are your top vitamins and supplements? Which one has made the most difference to how you feel? Very informative, I take a multi-vitamin , fish oil and vitamin D. But will start the magnesium and probiotic. I recently started calcium and have the vitamin C that I plan to add to my regimen. Thanks for the information! Great guide! I’m taking the magnesium regularly but need to look at adding some of the others to my list! Magnesium is so important – it’s great that you’re getting it regularly. Great start! I take apple cider vinegar and milk thistle. Both assist liver function and digestive health. I LOVE apple cider vinegar. It helps with SO many things. I even used it to make a spray for my dog when he had a skin condition.